When fall fruits go away, winter citrus comes out to play! 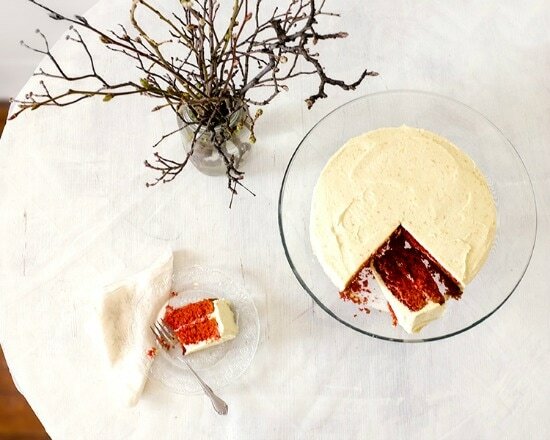 We offer you a seasonal cake recipe with a brilliant blaze of color under that frosty exterior. If you like cream cheese frosting, you will love this light fluffy rendition utilizing Morning Glory Original. Winter staples like blood oranges and beets are what lend this simple cake its vibrant color and bright flavor. In this recipe we challenge you to get LOCAL and encourage use of local ingredients wherever possible! 1. Preheat the oven to 350 degrees. Grease two 9-inch pans, or three 8-inch pans. Line the bottoms of the pans with circles of parchment paper. Grease again, and dust with flour. You can also choose an appropriately size pan for a single layer cake.2. In a mixing bowl, stir together the flour and baking soda using a whisk or fork. Set aside. Zest the oranges, and reserve the zest for the icing. Juice the oranges; you’ll want about 1/3 cup juice. Finely grate the beet to yield about ¾ cup. Immediately mix the grated beet with the vinegar. Add the orange juice, and set aside. ​1. Put a very thin layer of icing on the top and sides of one cake layer; this is your crumb coat. Place the next layer on top, and put a crumb coat on that layer too (proceed the same way with the third layer if you have one). Put the cake in the freezer for 5 minutes, or refrigerator for 20 minutes, until the icing feels firm. This firm crumb coat will keep crumbs from muddying your icing. We were so very inspired to share this adapted recipe. The original recipe was published by ---> edibleBROOKLYN.